Black and Jewish D.C. youth have gone on summer civil rights pilgrimages for years. 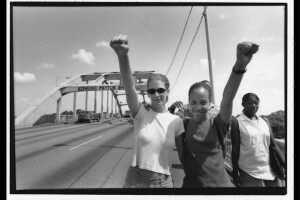 Here, Susan Barnett and Elia Emerson, pose on the Edmund Pettus Bridge in 1997. The relationship between the African American and Jewish communities is long and complicated, with periods of collaboration and discord. But one group of black and Jewish D.C. youth is looking to bridge the gap that has grown in recent years. The teenagers, members of non-profit Operation Understanding DC, boarded a bus Wednesday morning and will spend 23 days retracing the path of the Freedom Riders as part of a civil rights pilgrimage. Highlights include crossing the Edmund Pettus Bridge, site of Bloody Sunday in Selma, Ala., meeting community organizers and visiting various churches, synagogues and mosques. There is a history of black and Jewish Americans working together, particularly during the civil rights movement. For instance, Jews were involved in the establishment of the NAACP and participated in non-violent protests. Locally, Jews joined Howard University students in 1960 to push Glen Echo Park, then an amusement park, to desegregate. But the positive relationship between the two communities has declined in recent decades as legal civil rights victories were won but class and racial disparities grew.